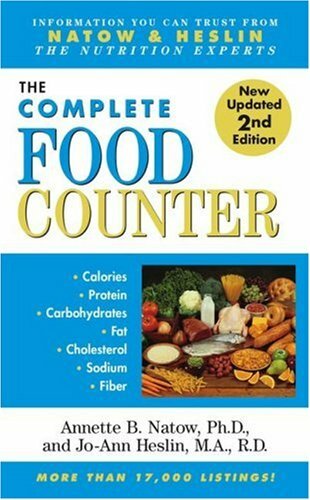 An all-encompassing food value resource provides more than 21,000 entries that list calorie, cholesterol, and other counts; includes coverage of take-out, vegetarian, and ethnic foods; and features a dictionary of terms. Simultaneous. Annette B. Natow, Ph.D., C.D.N., and Jo-Ann Heslin, M.A., R.D., C.D.N. are the authors of thirty books on nutrition, including two college textbooks. Both are former faculty members of Adelphi University and the State University of New York, Downstate Medical Center. They were the editors of the Journal of Nutrition for the Elderly for 23 years and serve as editorial board members for Environmental Nutrition Newsletter, Vitality, and American Baby Magazine. For more information on Annette B. Natow and Jo-Ann Heslin, plus articles and advice, go to: www.thenutritionexperts.com.